The first step of the scientific method is to ask a ________________. _______ _______________ controls what enters and leaves the cell. Process where cells divide to create two identical cells. Meiosis creates reproductive cells called ________. Organ that stores and breaks down food. All the members of a species inhabiting a given area. Watson and ________ created the first model of DNA. Genes are passed from _________ to offspring. Where is tRNA located within the cell? ____________ is the first stage of making a protein. ___________ are put together to create an mRNA strand. Nitrogenous base that is used in RNA instead of thymine. The third stop of the scientific method is to form a _______________. Must experiments will have control _______. A hypothesis is an _________ ______ based on your research that might answer your question. Research can be ______________ or going to the library to read others' research. Experiments need to have a dependent and independent ___________. The second step of the scientific method is to do some ___________. The fourth step of the scientific method is to create an _______________ to test the hypothesis. The _____________ is the dense area inside the nucleus that makes ribosmes. Red, orange, yellow, green, blue indigo, and violet are the colors of the __________ __________ ________________. Process where food and carbon dioxide are used to create energy for all cells. 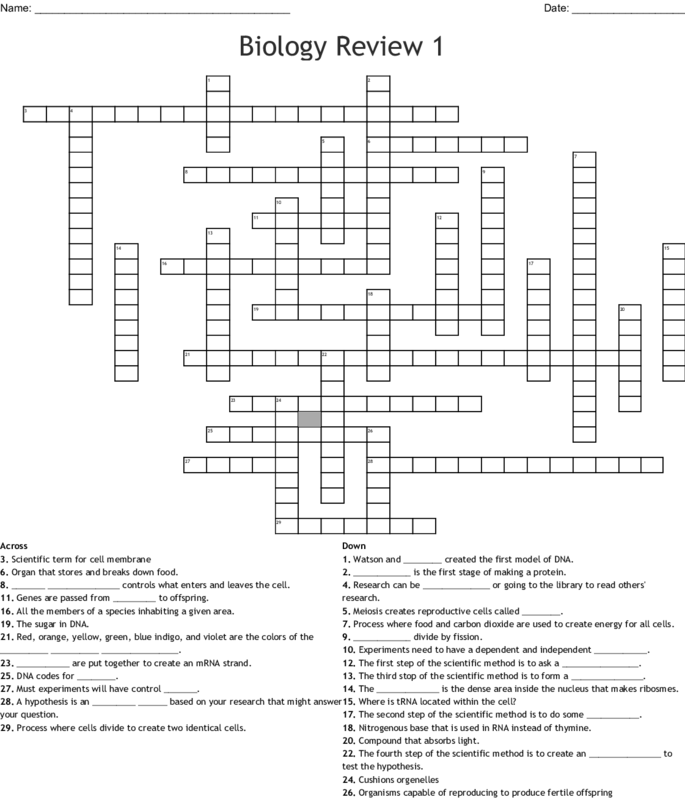 Review Crossword for Biology 1.